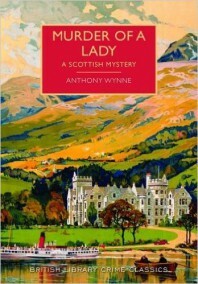 #26: British Library Crime Classics republishing Murder of a Lady (1931) by Anthony Wynne! Duchlan Castle is a gloomy, forbidding place in the Scottish Highlands. Late one night the body of Mary Gregor, sister of the laird of Duchlan, is found in the castle. She has been stabbed to death in her bedroom – but the room is locked from within and the windows are barred. The only tiny clue to the culprit is a silver fish’s scale, left on the floor next to Mary’s body. Inspector Dundas is dispatched to Duchlan to investigate the case. The Gregor family and their servants are quick – perhaps too quick – to explain that Mary was a kind and charitable woman. Dundas uncovers a more complex truth, and the cruel character of the dead woman continues to pervade the house after her death. Soon further deaths, equally impossible, occur, and the atmosphere grows ever darker. Superstitious locals believe that fish creatures from the nearby waters are responsible; but luckily for Inspector Dundas, the gifted amateur sleuth Eustace Hailey is on the scene, and unravels a more logical solution to this most fiendish of plots.Anthony Wynne wrote some of the best locked-room mysteries from the golden age of British crime fiction.This cunningly plotted novel – one of Wynne’s finest – has never been reprinted since 1931, and is long overdue for rediscovery. This is the first locked room/imposible crime that the British Library have republished, so here’s hoping it’s a sign of more to come as the series grows in popularity. Series editor and current Crime Writers’ Association president Martin Edwards will doubtless have more to say about this on his blog, so keep an eye on that for further information. Publication is cited for January 2016…can’t come soon enough! Being a fan of impossible crime stories, I am also very pleased. I hope they also publish The Case Of The Gold Coins, also an impossible crime novel and regarded as his masterpiece. Of the 28 novels of the author, as many as 16 belong to the impossible crime genre. I love that they’re re-releasing these collections and titles. There was a Christmas themed one on Netgalley recently and for some reason I didn’t request it. Wish I had now – am in the mood for some vicarious festive murdering. Might have to do Poirot’s Christmas pudding one for my December edition of Mondays are for Murder. Great news! I’ll echo the sentiment for republication of The Case of the Golden Coins and glad to read my review helped whet everyone’s appetite. Oh, great my comment finally appeared, as “your comment is awaiting moderation,” because none of the previous ones I attempted to post on previous posted seemed to appear. And I tried it from multiple devices. The trick appears to have been to remove my blog adress from the website section. Ah well. Haha, not sure what to tell you – I’ve just seen two emails asking me to moderate these two comments, though, so you should be up and running now; welcome aboard!